I have been having more fun with Aurifil LANA – the user friendly, wool blend thread on a spool. 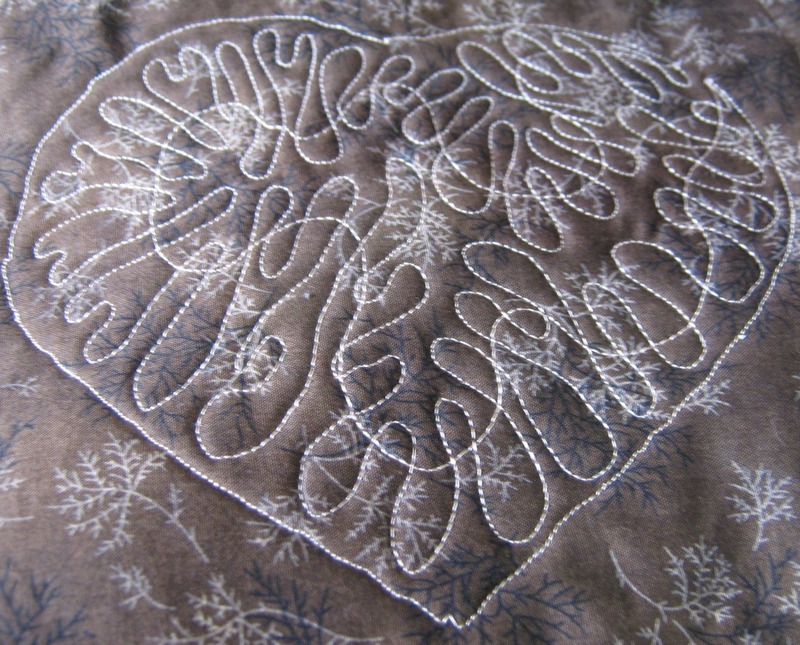 This blog shows how I used Lana as the thread of choice to embroider on linen. 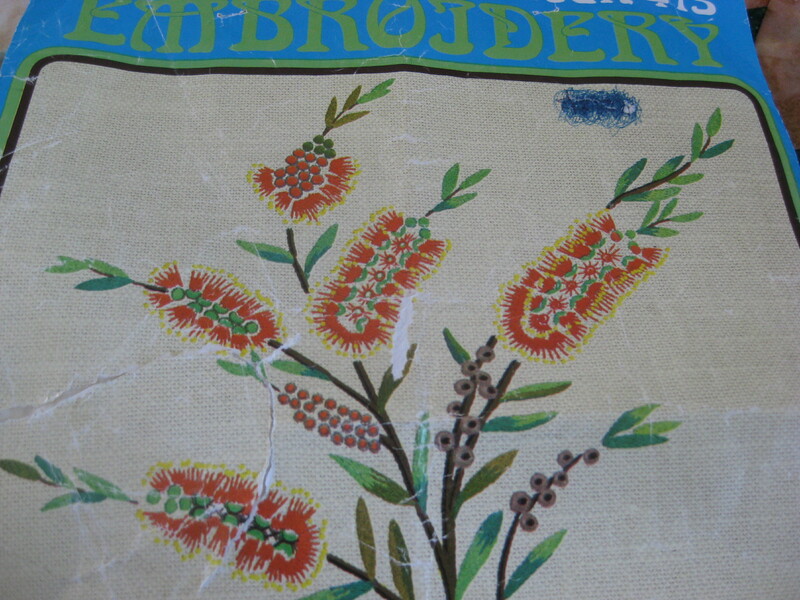 In my stash of ‘vintage’ embroideries and doilies I had a set of three printed with Australian Callistemon designs. The linen came with an old photo to illustrate the colours and some brief stitching instructions. 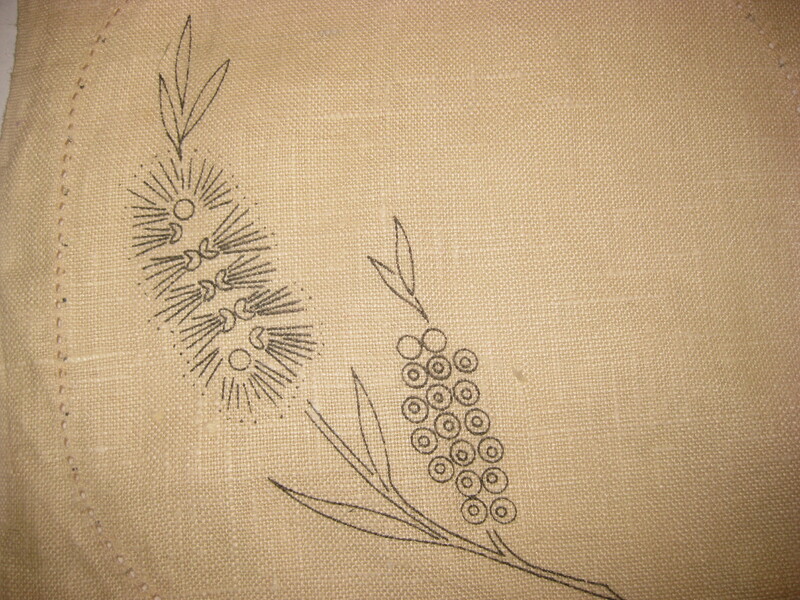 I then had to work out from the Lana thread chart, and some photos of Callistemons from the computer what colours I would work my embroidery in. At this time of the year, the flowers aren’t showing on the trees in my garden. 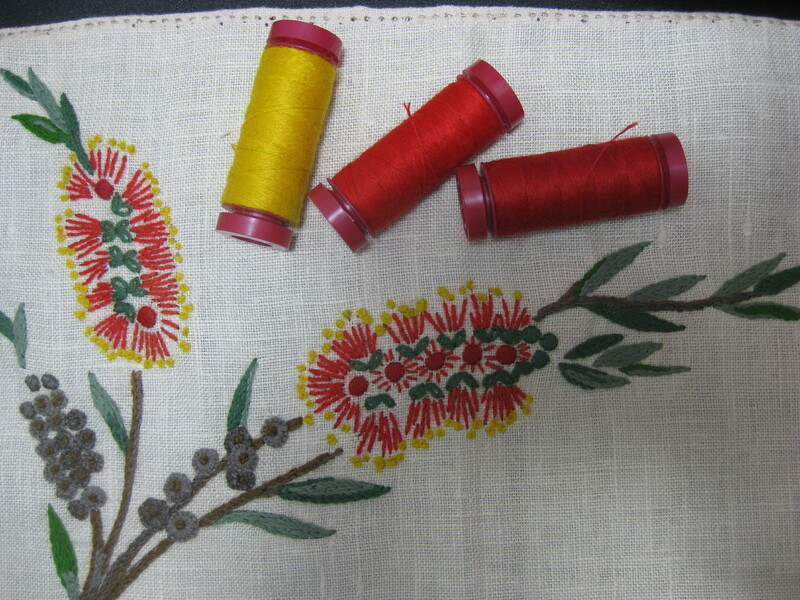 I used several different Lana colours for the Callistemon flowers, seed pods and the leaves. Even though Aurifil has a huge range of colours to choose from, I greedily wished I could add a few more to the range!! – specifically a few more ‘Australian’ colours!! Usually I prefer not to work with varigated threads, but I found the wool ones were superb – especially when used with the non- varigated ones. The slight variation was enough to give a subtle change in the embroidery and I will certainly use them again in embroideries. 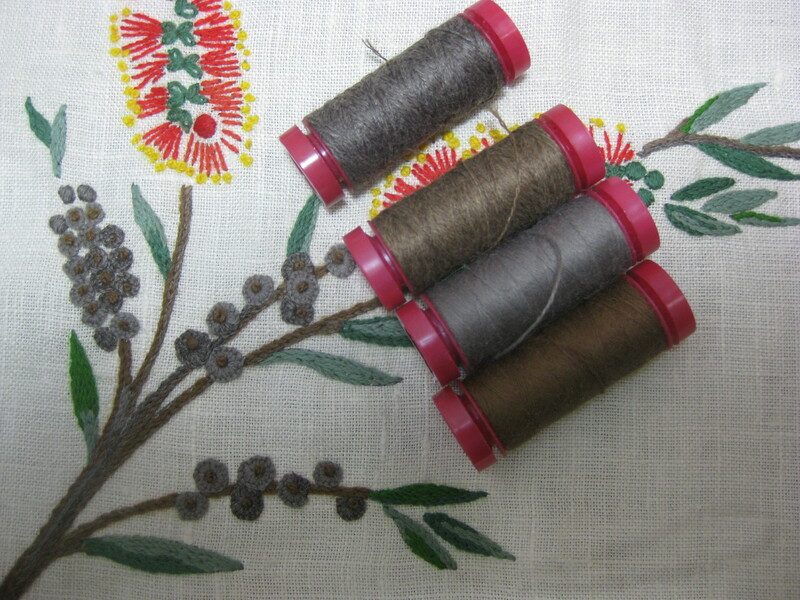 I hope that embroiderers do try using the Lana threads for linen embroidery – it is so easy to stitch straight from the spool. Wow! 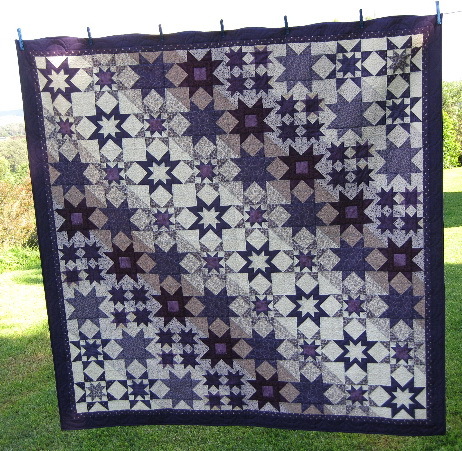 I’ve received a set of photos, and a story about a first quilt, from another one of our customers. 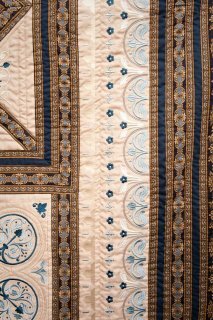 Remember earlier in the month when I wrote about Juliet’s quilt, I asked for more feedback about the quilts that you have made with Aurifil threads. Well, Strella responded with this great story, and set of photos. Strella is a dedicate machine embroiderer but this is the first time that she has used embroidered blocks to make a quilt. She said that the inspiration to start came from the Royal Reflections designs by Lyn Kenny. I was intending to embroider some blocks for a quilt on my Pfaff 2140, in its big Grand Hoop but then I got a Pfaff Creative Vision in January 2008 and an even bigger Grand Dream Hoop. Wow, I won’t need so many blocks if they are bigger! I created some blocks in Embird software for my GDH and sewed them out. However, each time I test sewed a block I decided I wanted to change something about it. May be it was to have the quilt line as a triple stitch instead of single running stitch, or change the colour combination. I could not decide on the colours for ages. Then I wanted a colour change within the circles. Where would my final decisions end? 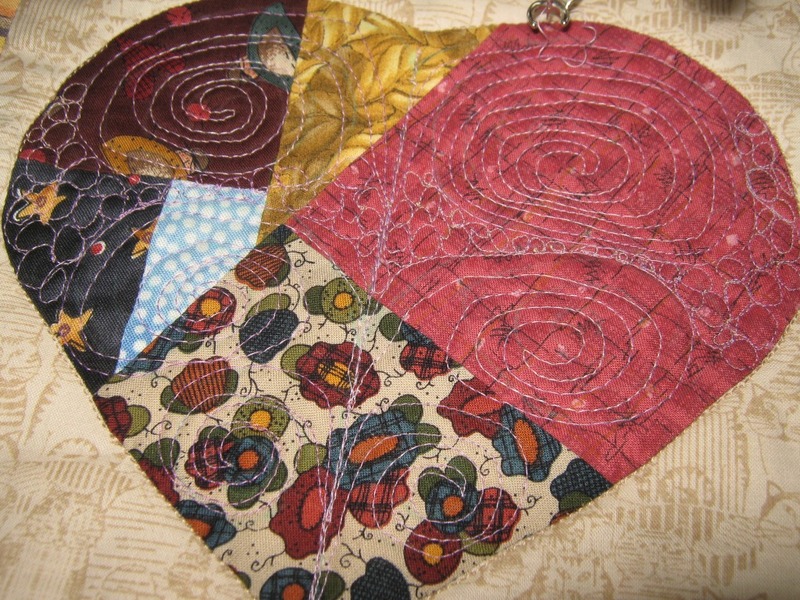 Sounds familiar doesn’t it, when can a patchwork quilt maker ever resist modify and tweaking the design? Strella’s colour inspiration came from a fat quarter of a Jinny Beyer border fabric that she had purchased at a Quilt show in Melbourne the year before. As always happens, when you decide that you have found the perfect fabric in your stash you never have enough meterage for the job, but a very good friend helped her track down more on the internet. So that was colour scheme sorted, especially as she had some satin-backed shantung in a light coffee to use as the background for the embroidery. I had put the central blocks together and decided then to do the borders down each side to make it wider. I discarded the first border attempt after getting the hang of long lengths of stabilizer and basting in the hoop first. 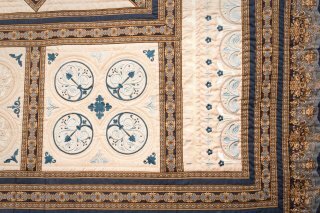 As often happens, what had started out to be a pair of single quilts ended up being a beautiful queen size quilt, as the embroidery & patchwork layout developed over time. And of course the finishing touch to every quilt is the label. 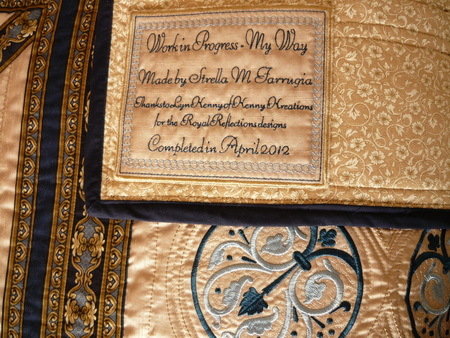 I have been lucky enough to watch the progress of this quilt over the years. 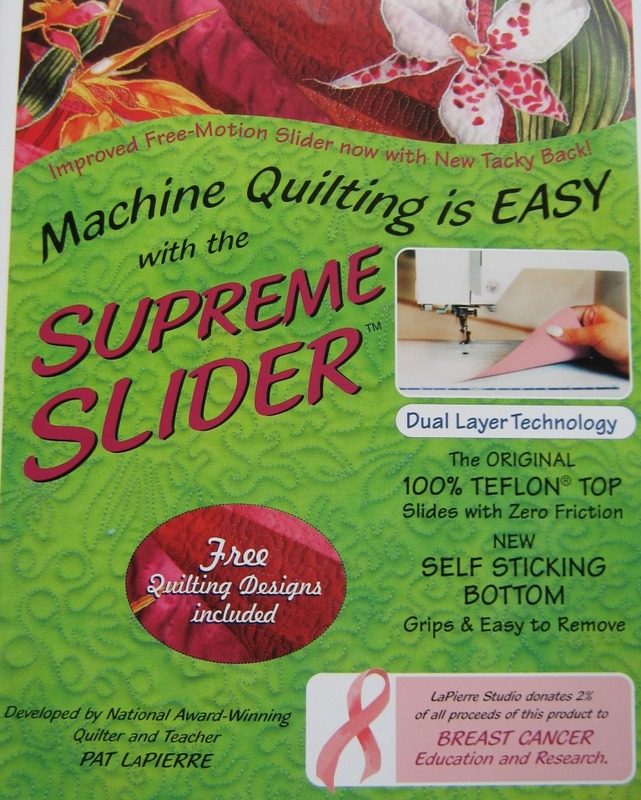 Strella has been a regular visitor in the store to purchase Aurifil thread for the embroidery and piecing, and recently to even purchase the backing fabric. So although I know very little about the machine embroidery techniques used, I can appreciate the beauty of this quilt when seen in real life. 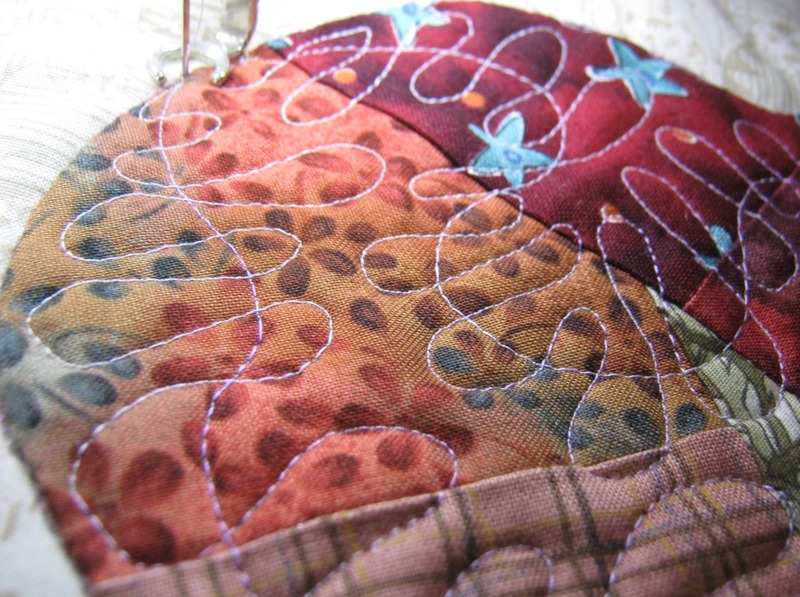 Don’t forget that we love seeing work that you have completed with Aurifil threads. So please send us good quality photos, and a brief story, so that we can share your project here with readers of our blog. I have great admiration for those craftspeople who design items, those who start with a germ of an idea and take it all the way to a completed masterpiece. 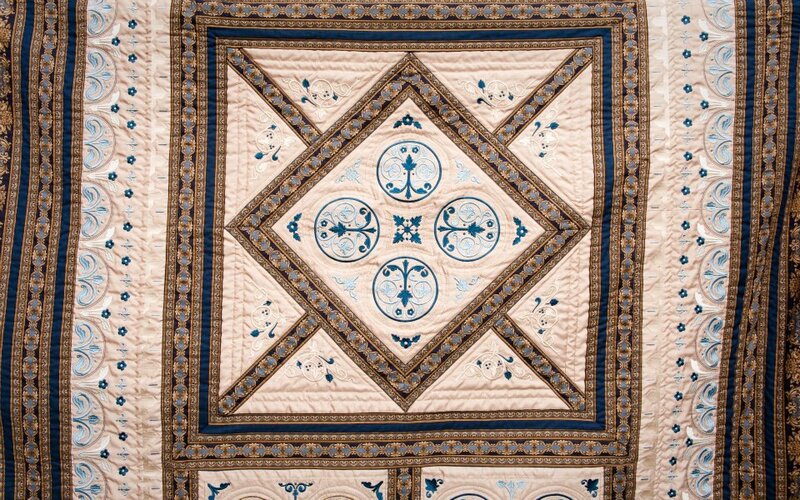 I am in awe of the talent of designers whose patterns for quilts and other items I purchase because I fall in love with the design. “I could never design like that!” I think. And yet, even if our creativity doesn’t extend that far, we all possess creative talents that are reflected in our finished projects (and even in the unfinished ones!!) 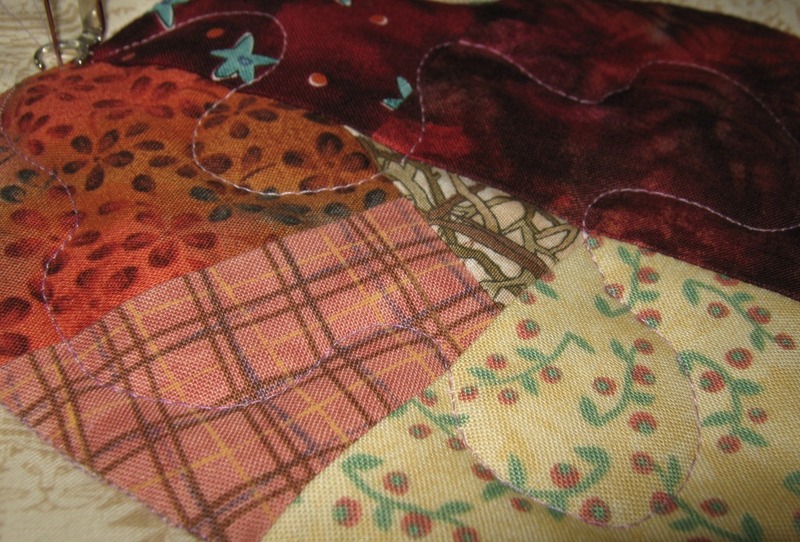 When we take someone else’s pattern and make a quilt or handcrafted item, we are using our creativity and putting our own personal stamp on it, from the choice of colour scheme, to the materials, threads and techniques we employ, and the embellishments we add. I must admit, that while I do not think I could ever design a quilt from scratch, I do like to do a far bit of “creative tweaking” once I have a basic idea to follow. I also like to “fiddle” with my knitting patterns. I actually like to buy old patterns, especially vintage ones which you quite often find in dusty corners of op-shops, so that I can use the stitches and design elements on other garments. Let me share some photos of my latest knitting creative tweaks. 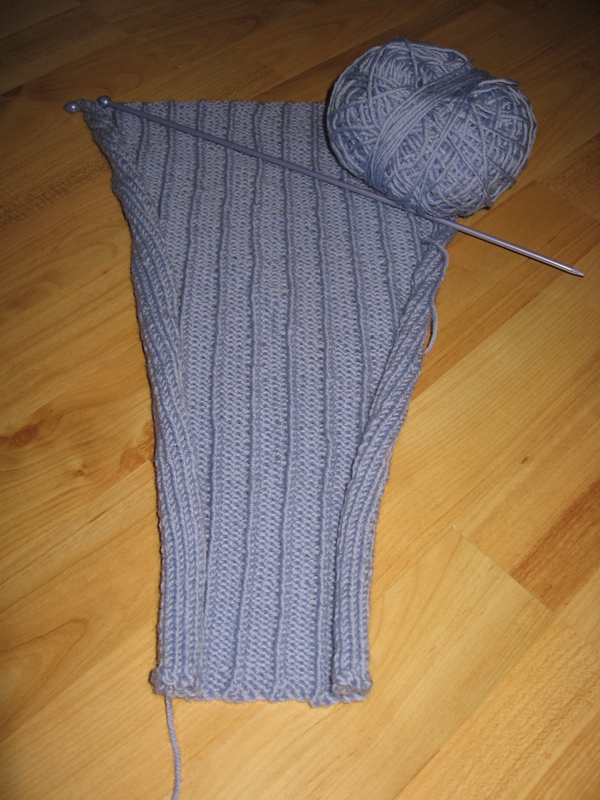 Knitting a long sleeve for my cardigan. The pattern I started with is designed by Amanda Crawford and was featured on the cover of The Knitter Magazine, Issue 7 (the knitter.co.uk) The original garment is knitted in cotton, is a jumper, has short sleeves and a scoop neckline. It is embellished with a knitted and beaded corsage of wisteria and has a ribbon threaded above the bustline. 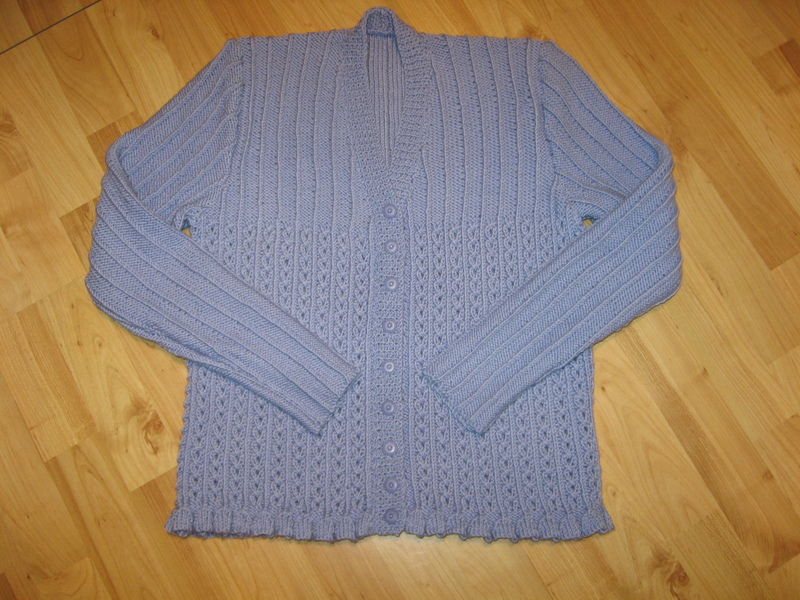 My version is knitted in 100% wool, is a vee-neck cardigan and has long sleeves. I picked up stitches sideways to make the button/buttonhole bands. I have not added the embellishments. Sewing on the buttons with matching Aurifil Cotton (50 weight). But back to my cardigan. 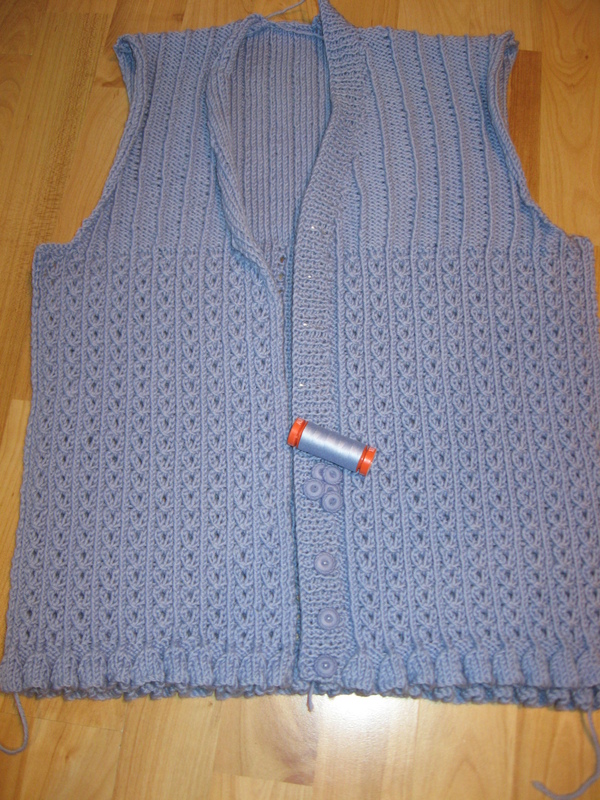 …and the finished garment looks like this. So while we may not all be able to design items from scratch, we are all able to creatively tweak and add our own touches to the things we make. Last evening I received a surprise photo, and email message, from a long term customer. It was such a lovely message, and it was obvious that Juliet was so excited that I asked for her permission to share her thoughts here. I’ve been purchasing Cotton Mako from you for at least 8 or 9 years (I can find receipts in my file dating back that far), but today is the very first time, in all that time, that I have finished a quilt which is completely sewn (pieced and quilted) using my Aurifil thread. In all that time, some (commonly available thread) has always snuck in somewhere. The colour chart that Juliet is talking about is the thread wrapped Cotton Mako’ chart, shown below, but we also have thread wrapped charts for the Lana, Brillo & Aurilux threads. 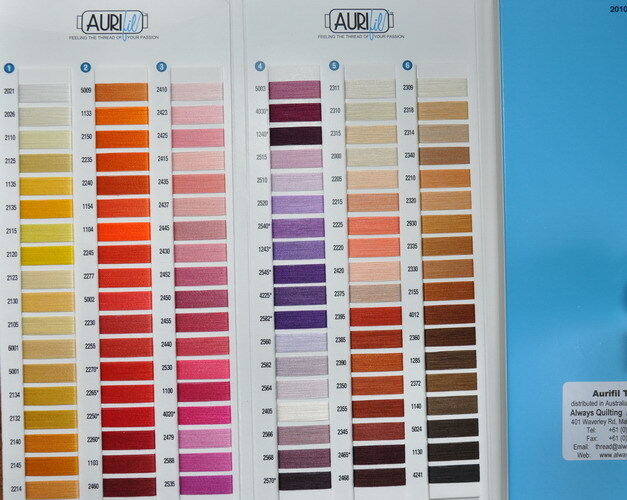 The Aurifil Cotton Mako’ thread wrapped colour chart, showing just 108 of the 252 colours on the chart. Having lived in country locations in the past, where it could be a 200 kilometre, or more, drive to the nearest shop selling textile products, I know the value of having a good stock of supplies on hand. Internet shopping has certainly simplified the distance shopping problem and, as Juliet said, a thread wrapped colour chart is the perfect tool to make choosing thread colours online easy. A colour chart is also a great help if you are working through the old threads in your cupboard, replacing those other brands with Aurifil. I really enjoy the conversations, and correspondence, that I have with customers. Sometimes, when life events slow down their stitching, I may not hear from someone for a year or more but they always come back to us when they return to their patchwork, quilting and embroidery. So, at Always Quilting we have many long term customers from around Australia and New Zealand, that we have never met in person, making a message like this was very special. 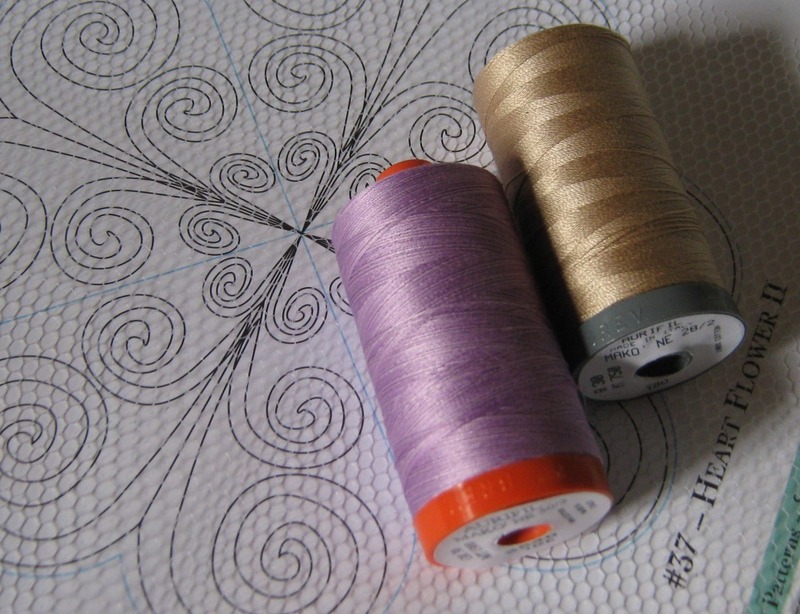 If you have a similar story of a project completely stitched with Aurifil threads please write to us, we love to hear your stories and see your work.